China's scrutiny of influential Western companies competing for a slice of its vast market has weighted down on Apple in an unprecedented manner. Compared to the likes of Google, which pulled its services out of the country or Qualcomm, which endured government probes and a hefty fine, the iPhone maker's Chinese operations enjoyed a "white gloves" treatment – until now. The State Administration of Press, Publication, Radio, Film and Television shut down Apple's iBooks Store and iTunes Movie in the country last week. According to informed sources, the regulator excercised its authority and demanded the procedure, despite the government's formal approval of Apple launching its services six months ago. If the Chinese government strengthens its grip further, it could seriously hinder Cupertino's attempts at securing the country's consumer electronics, content services, and mobile payments markets. China is the second largest market space for Apple, following the United States. The company is practically reliant on it for growth, as the Western market saturation manifests in slower than usual iPhone sales. The iPhone is Apple's best-selling and most profitable product, and anything that can stand in the way of its performance in key markets is of danger to the company. Moreover, app sales and services also serve as strong revenue generators for Apple, and the current development in China is most unwelcome for its business efforts. 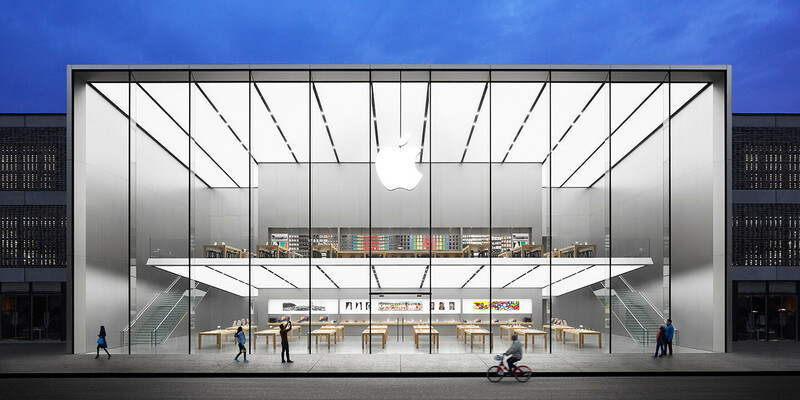 Apple's flagship retail store in Beijing. Advisor Daniel H. Rosen who specializes in Chinese economy explains the move with the government's policies of regulating the foreign content that citizens are exposed to, prioritizing its national security and domestic industries, and giving incentives to local technological giants Huawei, Alibaba, and Tencent. It is widely known that the Chinese government keeps close watch of eight American companies that it considers overly dominant in China's core industries, such as energy, communications, education, and defense. Since regulation increased over the eight companies, one of which is Apple, other American corporations like Cisco, IBM, Microsoft, and Qualcomm have experienced sales slowdown, unexpected raids, agency probes, fines, and pressure to conduct their business in ways that favor government agenda. Apple issued a statement saying it hopes to bring back its services to Chinese customers as soon as possible. In typical fashion, it declined to comment the situation any further. Maybe it's time for Apple to diversify and stop relying so heavily on mobile. Or else the Chinese government will continue to be an unnecessary damoclesean sword over their future. It's always been unwise to have 70% of their eggs in one basket, and they'll inevitably have to do it anyway. I agree with that - if China chooses to protect it's industries, the rest of the world should do the same. That's essentially calling for a reversal of globalization. I highly doubt that will happen. Or even could at this point. Why is PA calling it an "unprecedented" move? The actual NY Times article spells it out clearly that after the Snowden leaks Apple was identified as one of the 8 companies being a security threat and they've been moving to limit their access...such as with the iNews shutdown last year. Thus it begins for Apple they should have done what Google did years ago just pull out of the Chinese market. If the communist party wants to play these sort of games and protectionism of its local companies that just steal, copy and rip off American R&D then these companies should leave. However, this is exactly what these American companies deserve for pulling out of their own home soil and taking good paying American Jobs ( healthcare and retirement benefits) with them to China trying to lower their manufacturing cost while trying to sell back to Americans who have no Jobs to purchase their goods. The roosters are coming home to crow and I hope that Microsoft, Cisco, IBM, Ford, GM etc.. all get bit and please no bail outs but prosecution for their boards and CEO who will probably all make out with golden parachutes ... okay I am off my soap box now I am just so tired of hard working Americans getting screwed by corporate greed and politicians who do nothing to protect American workers. I agree with you for the most part but the fault starts with American people. Everyone wants the least expensive product and most care less where it comes from. So the companies that manufacture the products here in the States go bankrupt because of decline in sales. So these companies have to adopt and follow what the people want, which is cheap prices. A double edged sword indeed. America is weaken because your politician can be sway with bribe. Any country that has a high level of corruption will be doom to poverty.